Almost everything you have been told and taught about heartworm is probably an exaggeration or an outright lie, and this misinformation is probably costing you real money. 1. Heartworm is not a canine pandemic. Data on heartworm incidence rates at the local level reinforces how rare heart worm really is. For example, on the map above, California is coded red-hot with 500 cases. And yet, when a total of 4,350 dogs in 103 Los Angeles County cities coming from 21 participating animal hospitals were tested, only 18 heartworm-positive tests turned up. And yet, veterinarians are training their staffs not to talk about heartworm tests and medications as an option, but as a need, and for this "needs to be given" message to be bombarded on the customer 3-5 times per office visit. 2. Heartworm infection is NOT rapid and will not kill your dog overnight. 3. In most of the country, only seasonal heatworm "prevention" is needed. Look carefully at the maps below (click to enlarge). 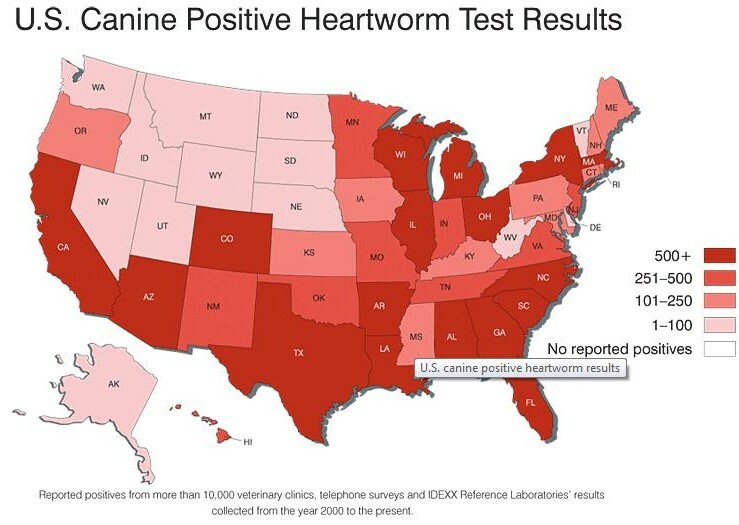 These maps come from "Seasonal Timing of Heartworm Chemoprophylaxis in the United States" by Dr. David Knight and James Lok of the American Heartworm Society. Find your area on the map, and begin heartworm treatment on the first day of the month noted in Map A, and end treatment on the first day of the month noted in Map B. In short, if you are living in Virginia, you would begin treating your dog June 1st (top map) and end treatment on December 1st (bottom map). 4. There is no "preventive" medicine for Heartworm. 5. Heartworm "prevention" medicines are actually toxic poisons. 6. Humans cannot get heartworm. 7. Some breeds of dogs should not be treated with Ivermectin. Some lines of collies and collie-crosses have strong -- sometimes fatal -- reactions to ivermectin, the most common heartworm preventative medicine. Though this is not common, and seems to only hold true for collies, serious thought needed to be given to dosing any collie, collie-cross, or herding dog with white feet Ivermectin. For these dogs, the safest heartworm medicine is Interceptor. 8. 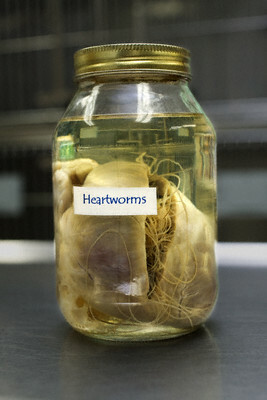 What about that wormy heart-in-a-jar at my vets office? 9. Do I have to go a veterinarian to get Ivermectin? No. More on that in a second. Suffice it to say that it's not necessarily a bad thing to go to a vet for a prescription for Heartgard, especially if you are going to see your vet on another matter anyway. I would not buy Heartgard from the vet, however, without first checking prices online. Most vets price-gouge their customers by 100 percent or more for medicines sold in their offices, and in most states a veterinarian cannot charge you more for writing a prescription for a medically necessary medicine as part of an incidental visit. Another cash-saving tip is to get a prescription for Heartgard for a dog twice the size of your dog, and then split the tablets in half. This trick results in considerable savings because the marginal cost between one Heartgard weight category and the next is often very slight despite the fact that one pill contains twice as much active ingredient as the next. Finally, remember that you do not have to dose your dog all year long or even every month. In fact, if you have a 50-pound dog, and buy 12 doses of Heartgard for a 100-pound dog, you could be 100-percent covered for six years, even in a year-round heartworm area, provided you dosed your dog once every three months and cut the pills in half. Of course, if you want to dose your dog every month and do so cheaply and without going to a veterinarian for a prescription, there's a trick here too. Here it is: Order your Ivermectin in a pre-mixed solution. The cost is $25 for a 65-cc bottle of .05% Ivermectin, which is enough to treat five 20-pound dogs for 26 months. J.R. Enterprises even throws in a measuring spoon! Since this Ivomec and polypropelene gylcol solution is not FDA-approved for dogs, they sell it for experimental purposes only. That said, it works fine, and this is exactly the kind of heartworm preventative medicine used on all dogs all across this country prior to the advent of Heartgard and "the billion-dollar heartworm scam" in 1986. Buy a 50 cc bottle of 1 percent Ivomec solution. This should cost you less than $50, and is made to inject into farm animals as a wormer. This is high-grade Ivermectin, and is made by Merial, an established veterinary pharmaceutical company. You will not be injecting your dog with a diluted version of this medicine, but instead you will be giving it to your animal orally. A single cc (which is the same as 1 ml) of 1 percent Ivomec (Ivermectin) is enough to prevent heartworm in 30 100-pound dogs for a month. What this means is that unless you have a really big kennel of really big dogs, you will need to pull 1 cc of Ivomec into a 1 cc tubercular syringe, and dilute it with 19 cc's of propylene glycol which will give you a 1/20th solution. When mixed in this proportion, you give one cc orally per 40-pounds of dog once a month for heartworm prevention. A 20-pound dog would get 1/2 of a cc orally. A 10-pound dog would get a 1/4 of a cc orally. An 80-pound dog would get two CC's(milli-liters) orally, etc. 10. Do I need to have my dog tested for heartworm before starting Ivermectin? 11. Is curing heartworm expensive and difficult? No it is not. Any veterinarian who tells you otherwise is not keeping up with the literature. It turns out that even if your dog has adult heartworms, if the dog otherwise appears healthy (i.e. it is active, not lethargic, and does not have a chronic cough), a monthly dosing of Ivermectin at a dosage normally used to kill roundworms (a dosage that is 3 times higher than that used to simply prevent heartworm), plus a once-a-month 5-day dosing of Doxycycline (the same antibiotic used to treat Lyme disease) will kill all the adult heartworms if it is sustained for a period of 18 months. This treatment works better than previous Ivermectin-only treatments because the Doxycline wipes out the Wolbachia microbe that grow in the gut of the adult heartworm, essentially sterilizing all of the female heartworms. A round-worm strength dosing of monthly Ivermectin will not only prevent new heartworm microfilaria from taking hold in your dog, it will also work to dramatically shorten the life of any existing adult worms in your dog. Bottom line: after 18 months of treatment, your dog will be heartworm-free at very little cost compared to other remedies. A repeated caution, however: if you have border collies or herding dogs with white feet that also appear to have full-blown heartworm, consult a veterinarian, as some lines of collies are very susceptible to Ivermectin toxicity. This is very rare, and the cause is unknown, but it is an area of concern among collies and collie-crosses. A simple rule of thumb: if you dog can take HeartGuard without issues, and the main active ingredient is Ivermectin, then you will have no negative issues using Ivermectin in liquid form. It is the exact same amount of the active ingredient Ivermectin. Copy Link: What is the Billion Dollar Heartworm Scam?